Here are some paintings I have completed in the last year or so, along with a bit of commentary about each one. 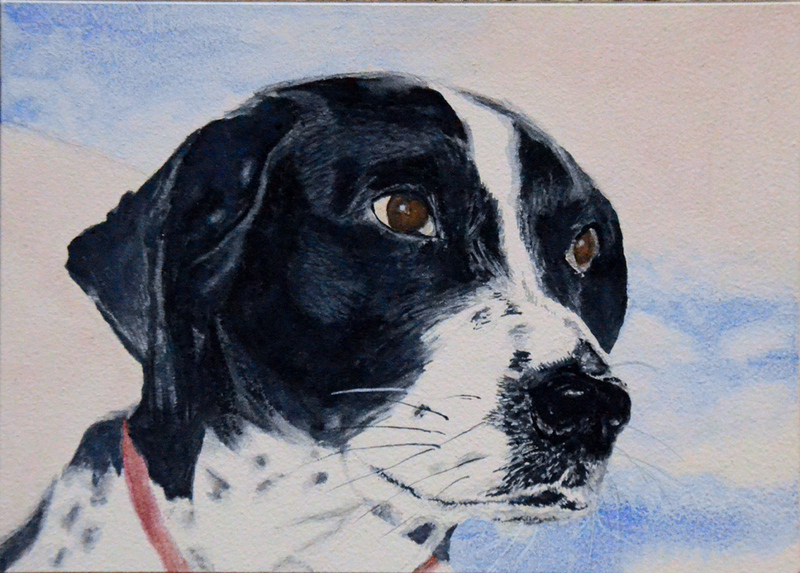 A watercolor on Aquabord™ memorial portrait of Izzy, commissioned by a friend after the owner knew it was time to send her aged companion over the Rainbow Bridge. This was painted from a black and white photo, and fortunately for me as the artist, the dog was also black and white so I didn't have to do any guesswork about the color. This portrait was received with tears of gratitude. Just about made me cry too! 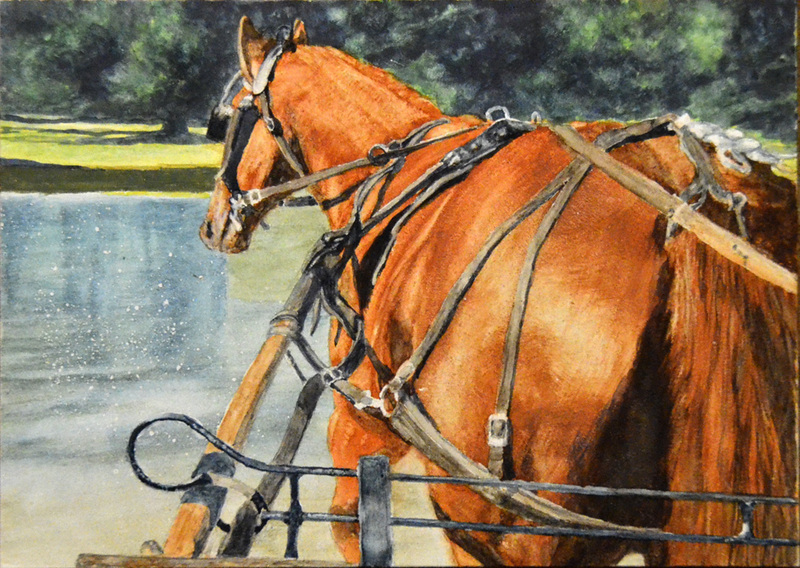 EmyLou is a memorial portrait, watercolor on Aquabord™, of a driving mare beloved by both her owner and her trainer. 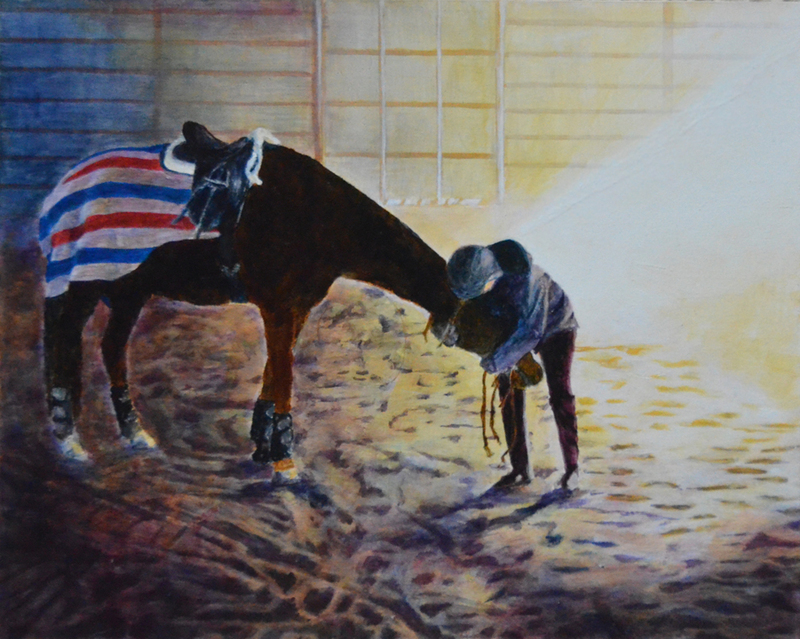 Her trainer commissioned this portrait as a gift, from a photo taken when they competed at the National Drive at the Kentucky Horse Park. The painting is an almost exact replica of the photo, only a few insignificant details changed. 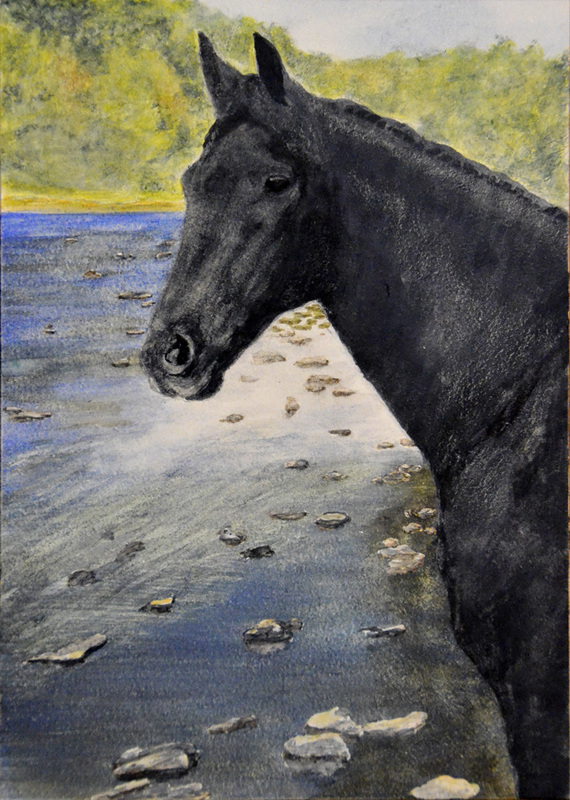 Lou, a memorial portrait of horse and owner, commissioned as a gift. This one required a bit of creativity in that the original photo was taken in Lou's dark stall with a flash. I looked at the colors in the photo and remembered a wintry photo I had taken of the pond and trees across from Lou's barn. 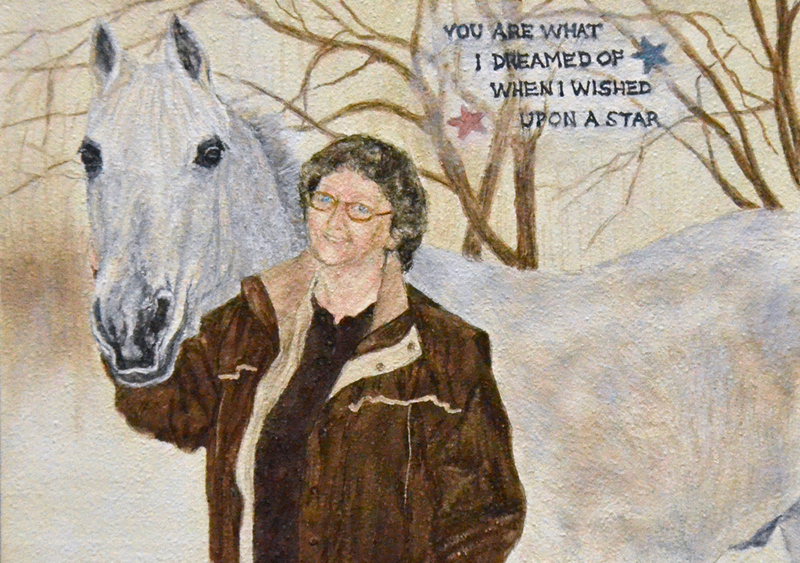 The owner's winter jacket fit right in with the background, and the "wish upon a star" saying was taken from a wood plaque hanging in Lou's stall. 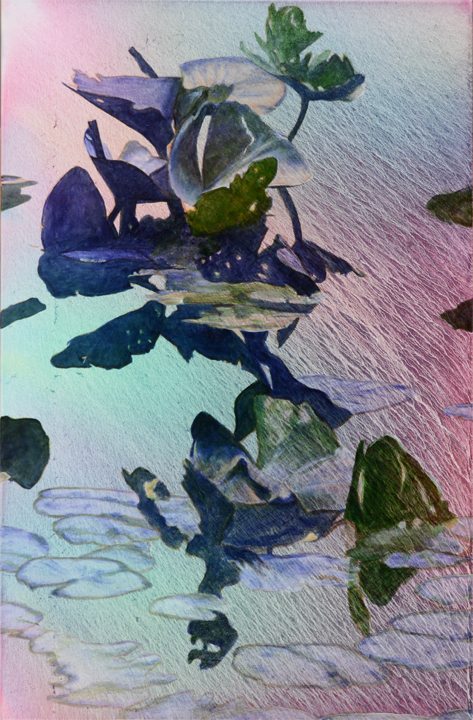 "Shadow", an Aquabord™ Christmas present commission from the recipient's sister. This one involved using one photo for the horse's body and another for his head. This was done to get the best portrayal of each area. Then the body with the new head were placed in a photo of the owner's favorite place to ride Shadow. Everything came together nicely! The Sky Pads series, quite a project! Sky Pads 1, first in a projected series of 10, which has now become 21...and will apparently keep increasing until I have exhausted all possibilities! 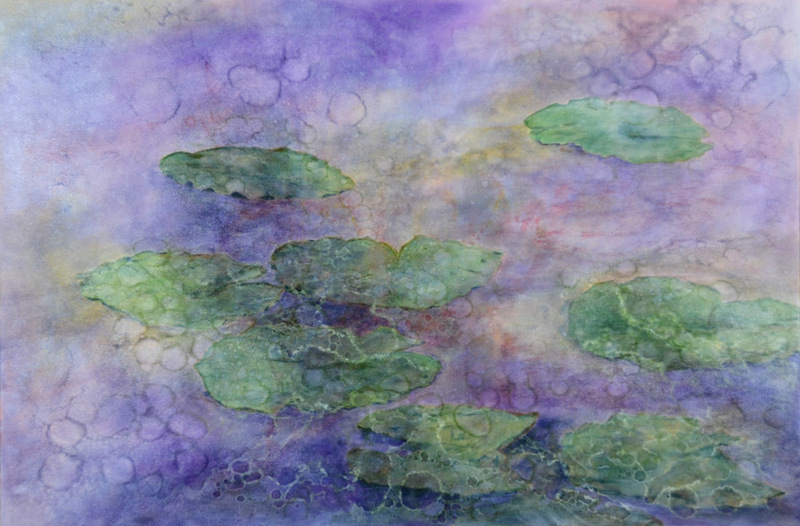 It was inspired by the illusion of lily pads floating in clouds, which were reflected in the water of the Mill Pond located behind my house. This painting is available on the Oil Landscapes page. Sky Pads 2, with new colors and a slightly different technique. I expect these changes to continue as the series progresses, which is what makes it fun and interesting. This painting is available on the Oil Landscapes page. 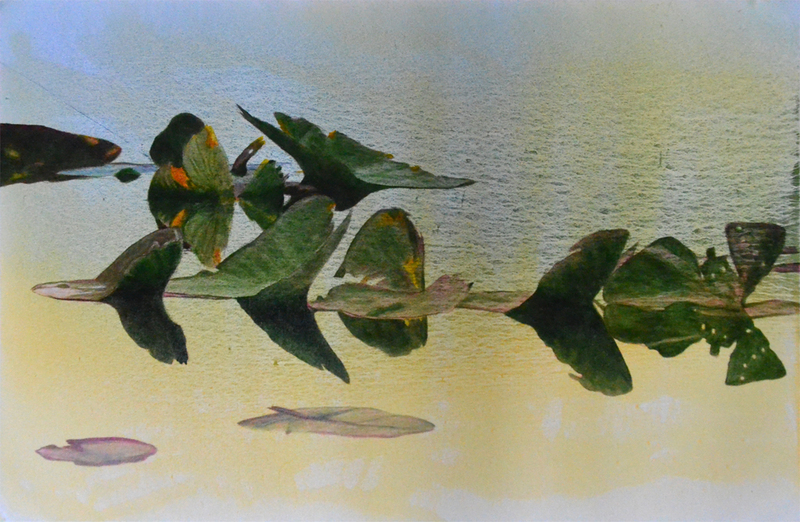 Sky Pads 3, developing the water patterns. This painting is available on the Oil Landscapes page. 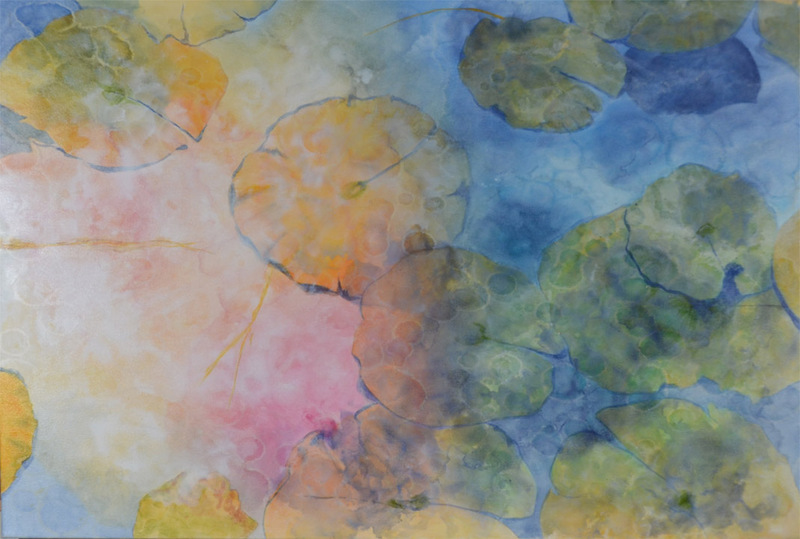 Sky Pads 4, an experiment with a lovely vertical cascade, preserving the color palette of the two previous paintings in the series. This painting is sold. 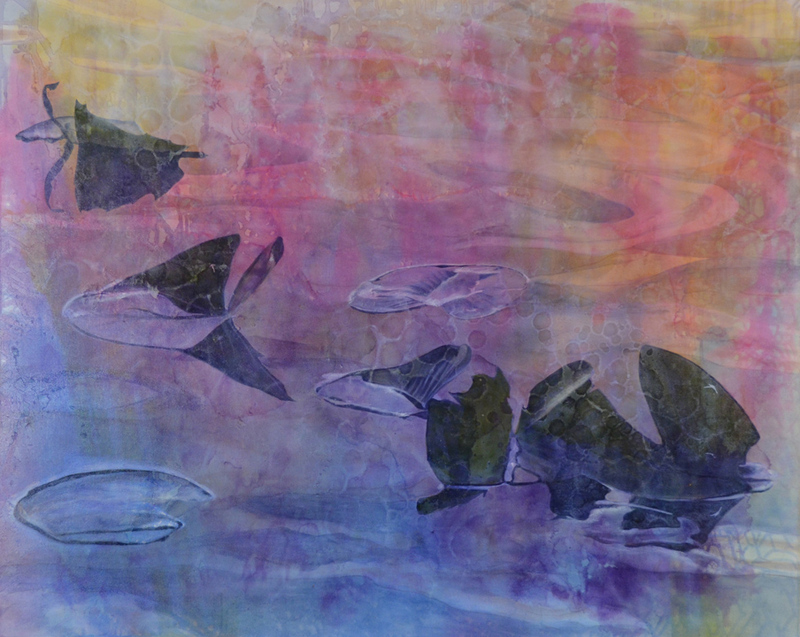 Sky Pads 5 continues the vertical concept, and adds a more ethereal look with transparencies and highlights. Now it's not as certain what kind of surface the pads are floating upon. This painting is available on the Oil Landscapes page. Sky Pads 6 adds even more complexity to the layers, blending surface with reflections and shadows, topped with a misty quality. This painting is available on the Oil Landscapes page. Sky Pads 7 emphasizes the importance of the environment over the presumed subject matter. 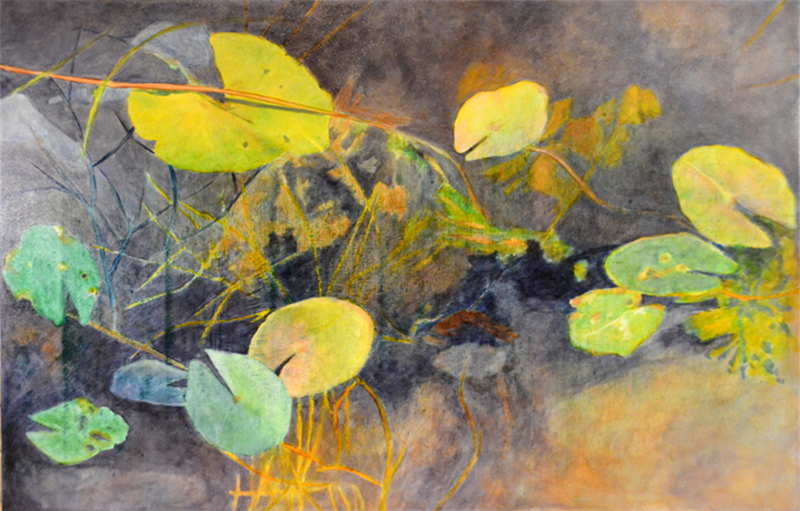 The deepness of the many color layers gives this painting a richness and a mystery that could not be achieved by concentrating on the physical lily pads alone. This painting is available on the Oil Landscapes page. Sky Pads 8 is a bit of a throwback to Sky Pads 2, illustrating the circular nature of this series, which is more of an exploration than an orderly progression. This painting is available on the Oil Landscapes page. Sky Pads 9 is a return to the color palette of Sky Pads 1, with more emphasis on the clouds and reflections in the water than was evident in the earlier version. This painting is available on the Oil Landscapes page. 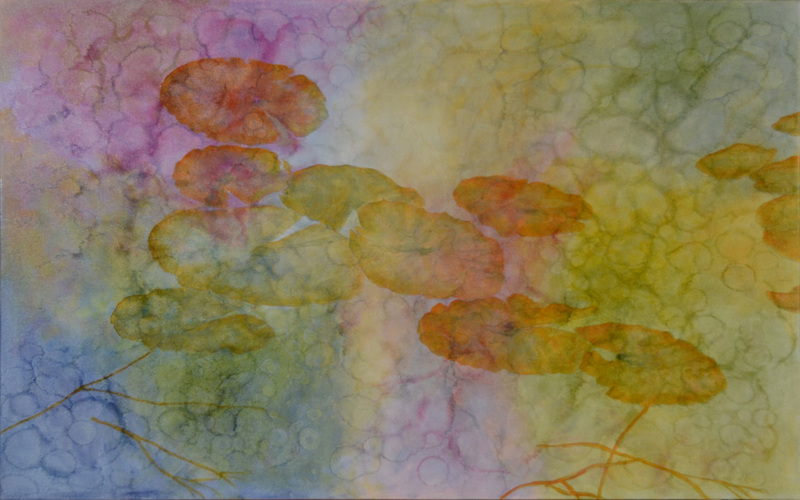 Sky Pads 10 is the first in the series to address the vertical aspect of water lilies. 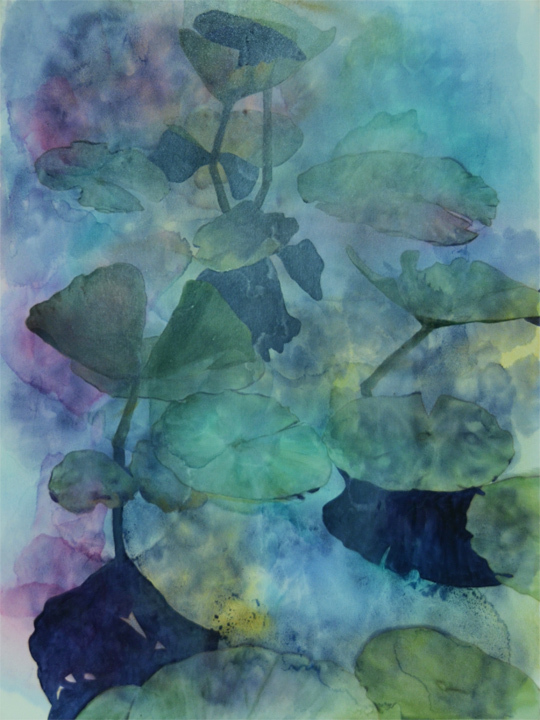 This composition offers a study in contrast between the flatness of the pads and the energetic upward reach of the stemmed leaves. 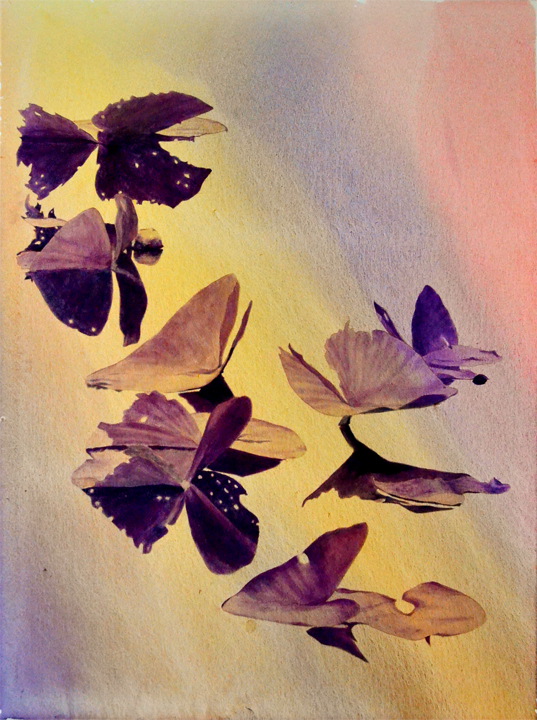 The strong shadows add a third dimension, then all three are melded together by the binding effects of the color layers. This painting is available on the Oil Landscapes page. 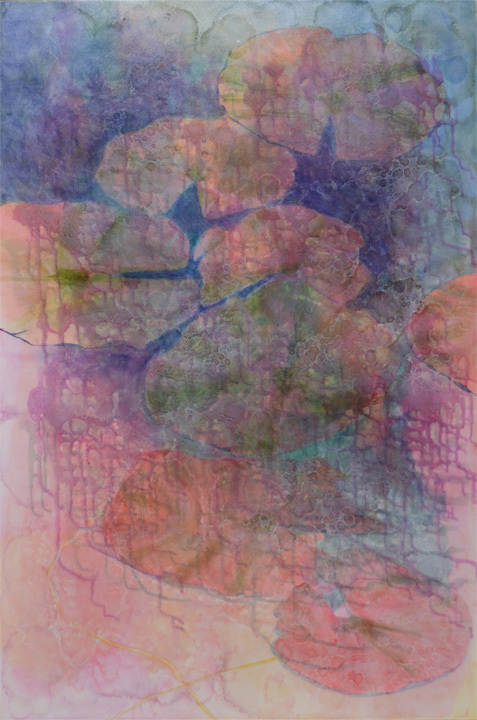 Sky Pads 11 is the largest painting in the series so far, and at 4 feet by 5 feet it benefited from all the various exploratory techniques which preceded it. 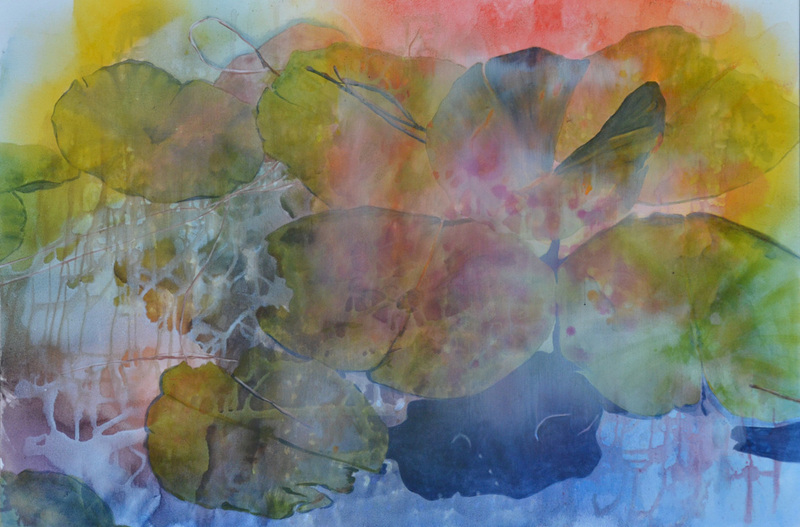 All of the ephemeral watery/cloudy/foggy effects are here, coupled with strong movement of colors and lily pads and leaves that fade in and out of a moody liquid context. The observer will create the scene. The artist has provided the raw elements. This painting is available on the Oil Landscapes page. After a bit of a hiatus, Sky Pads 12 is finished. 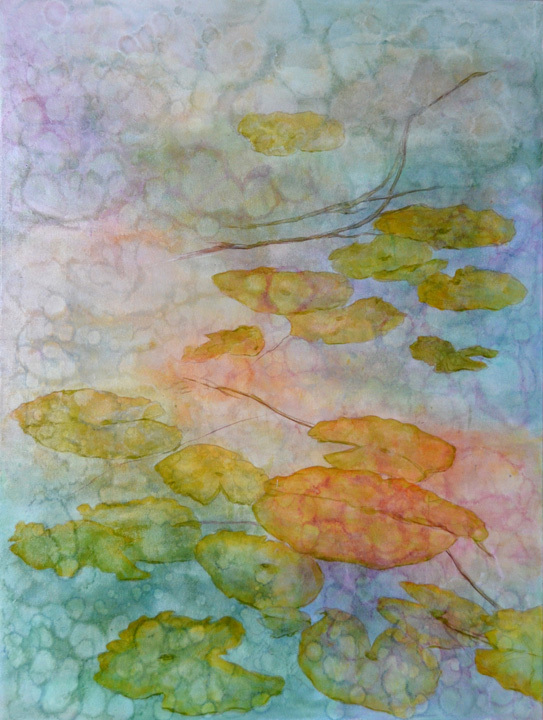 At 36" x 48" it is in the size range of most of the series. This one is the most vibrant, color-intense painting yet, which does not surprise me since as I progress in a series an increase in color saturation and contrast is what is likely to happen. This painting is available on the Oil Landscapes page. 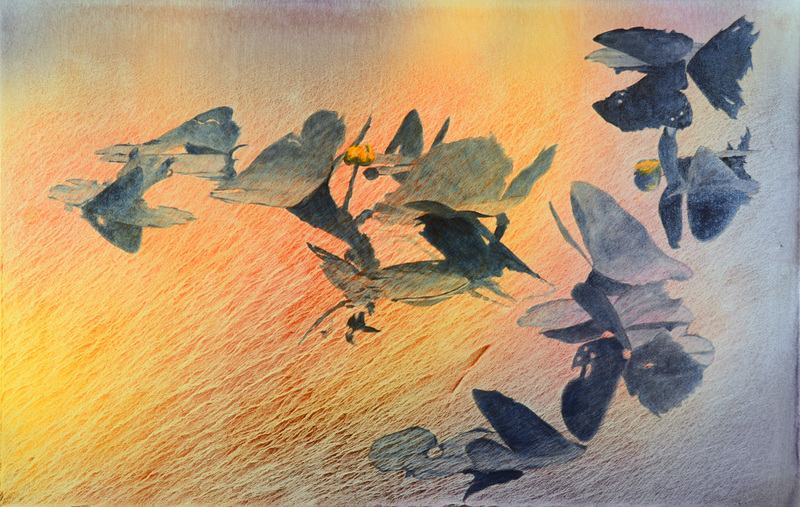 With Sky Pads 13 I thought it might be a good idea to try to backtrack a bit toward the ethereal light quality of some of the earlier Sky Pads paintings. After the "paint riot" that was exemplified by number 12, I knew it would be difficult to regain a light touch but I really felt that this particular composition demanded it. 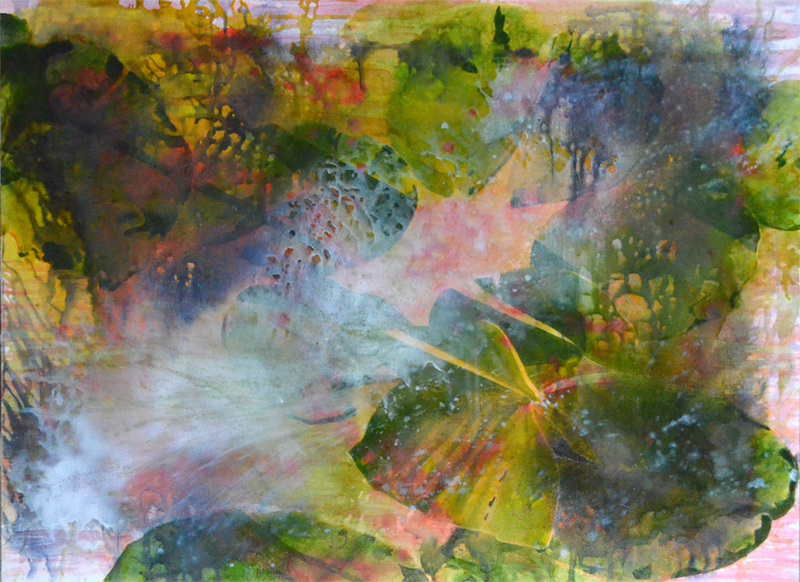 To me this painting represents sort of a half-way point between the early works and Sky Pads 12. I hope to stick around in this interpretation for at least a little while. This painting is available on the Oil Landscapes page. Sky Pads 14 is a few steps further along the stylistic path begun by #13. 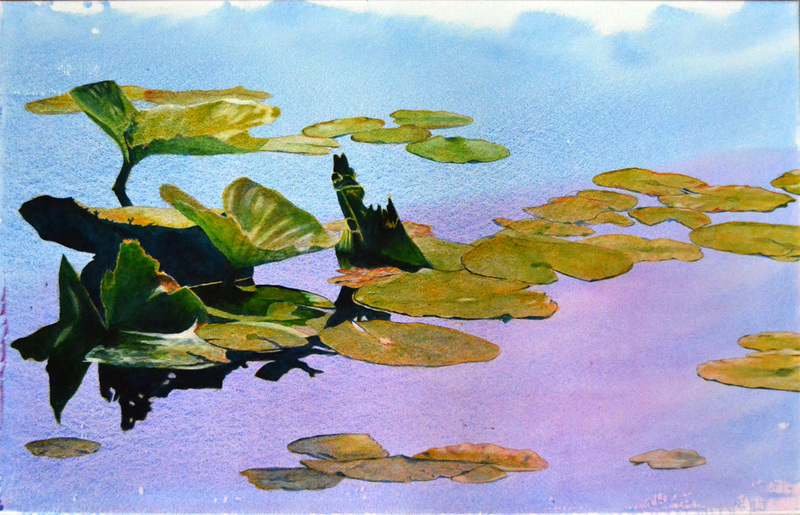 A bit more subtle in its illusion of depth with a bit more of water surface reflection for the viewer's eye to play with. This painting is available on the Oil Landscapes page. Sky Pads 15 took the color palette from #9 and heightened saturation, brightness, and contrast. 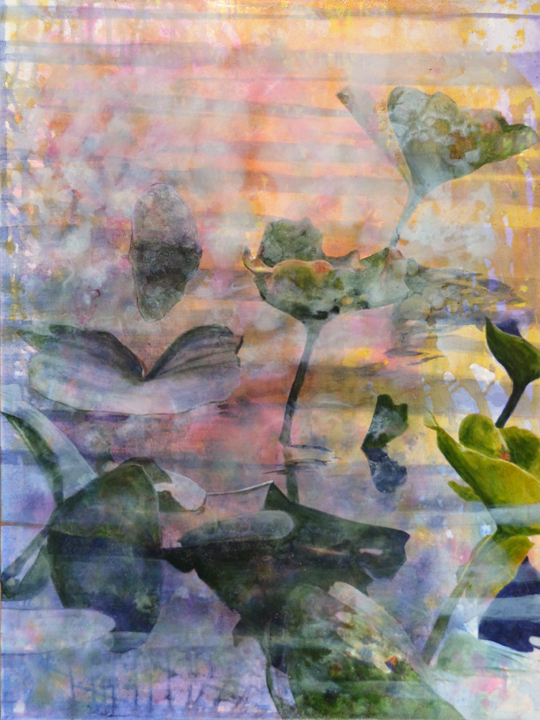 There isn't much of a suggestion of clouds in this one, but rather a focus on looking directly into the shallow water searching for underwater forms created by the sinking of deteriorating foliage and the eruption of new leaves which have still not risen above the water's surface. This painting is available on the Oil Landscapes page. I have nicknamed Sky Pads 16 "Sweet Sixteen"--it just seemed like a happy number to finally arrive at. I've got plans for #17, because there is no set limit on how far this is going to go. 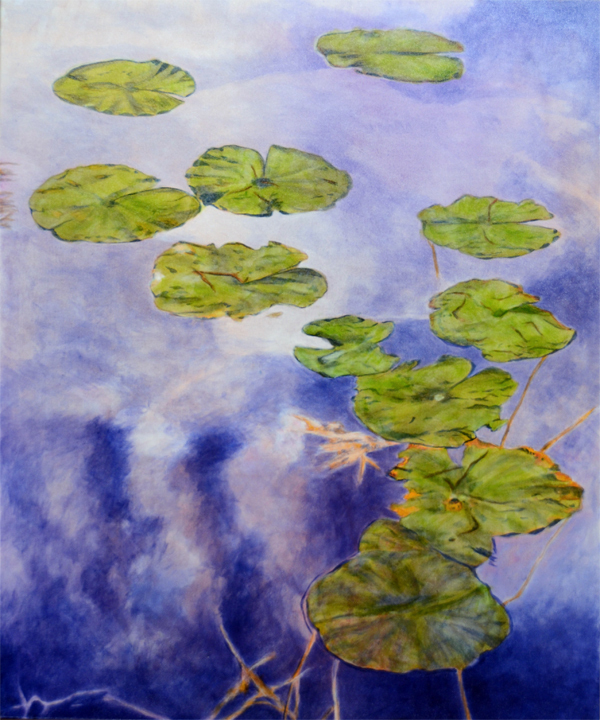 In the meantime, I'm appreciating how this painting really does make the pads look like they're suspended in clouds.This painting is available on the Oil Landscapes page. The intriguing background for Sky Pads 17 came about purely by accident. All of the paintings in this series have an initial poured paint background but it never turns out the same because it is essentially random. 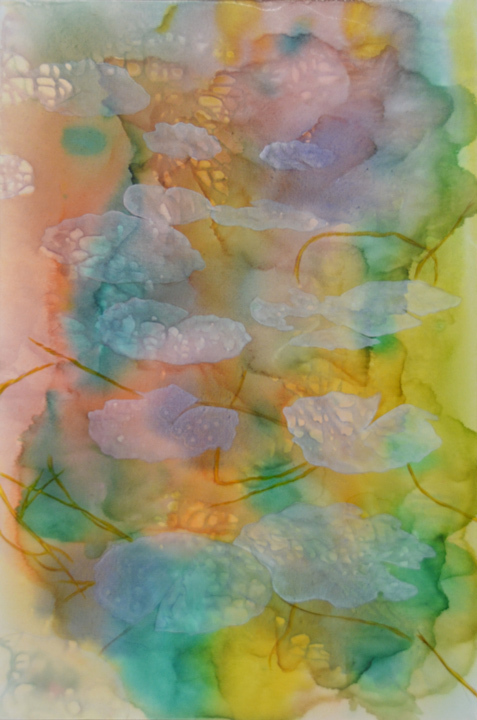 In this one, the paint separated itself out of the paint thinner I used to make it a thin liquid, creating this nice sense of flow under the pads. This painting is available on the Oil Landscapes page. I was hoping to duplicate the poured background technique used in Sky Pads 17, and #18 looks to be a successful effort. I felt that the fact that the paint was poured on a sweltering hot day was an important factor, so I waited for the weather to heat up again. Sky Pads 18's composition is more complex than its predecessor but it still partners with the flowing background in an eye-catching way. This painting is available on the Oil Landscapes page. 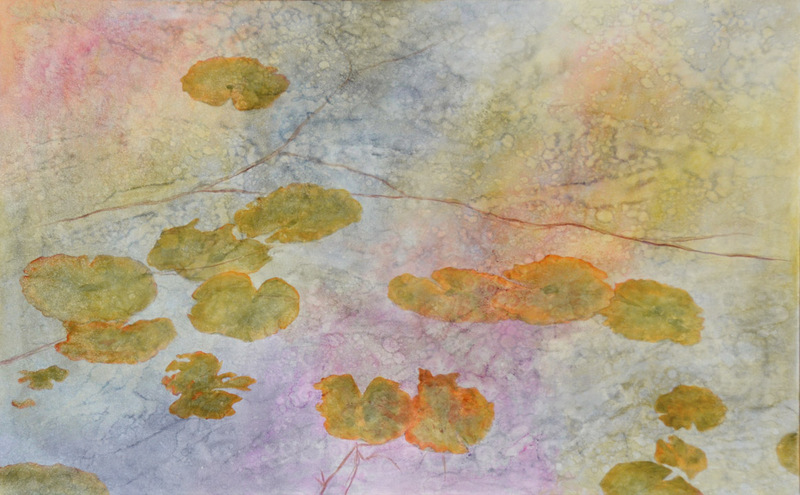 Sky Pads 19 continues the new direction with the natural effect of the poured paint background. This painting is available on the Oil Landscapes page. Sky Pads 20 adds a little element of floating fantasy to the randomness of the poured paint. This painting is available on the Oil Landscapes page. 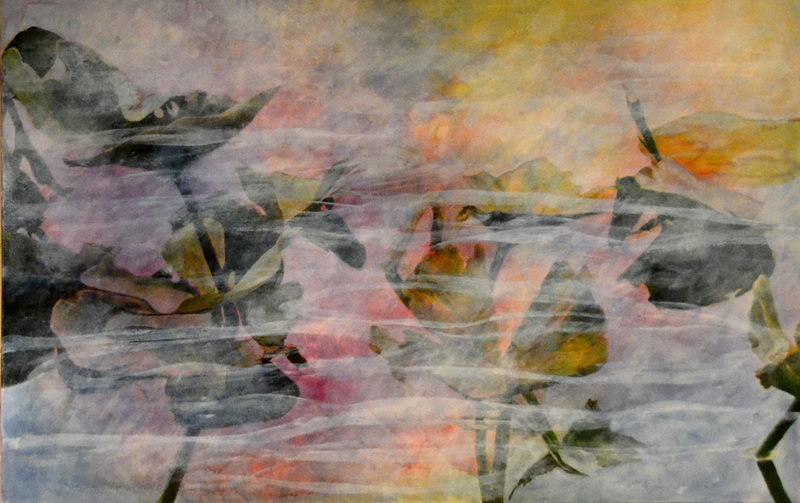 Sky Pads 21 is the first painting in the "flowing background" style that I have tried in cold weather. Sky Pads 17 through 20 were all started on quite hot days, which aided in getting the pigments in the poured paint wash to separate out into interesting patterns. At first I thought the background was too undefined, but decided to go along with it anyway and see what would happen. 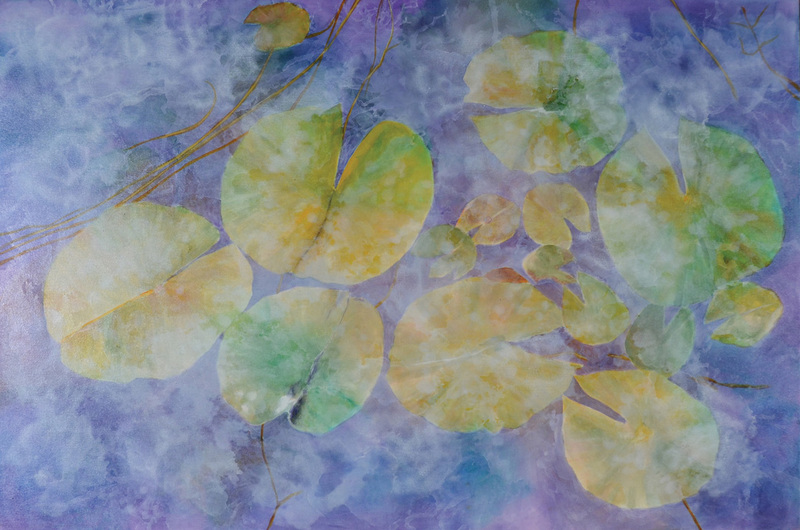 I'm glad I did, as this ephemeral background turned out to be perfect against the strong shapes of the lily pads. This painting is available on the Oil Landscapes page.